I didn’t think that Yao’s busy Thursday schedule could be topped on Friday, but it did. So much happened, it took me a day to go through all of the photos (after my machine crashed and took me all day to fix). 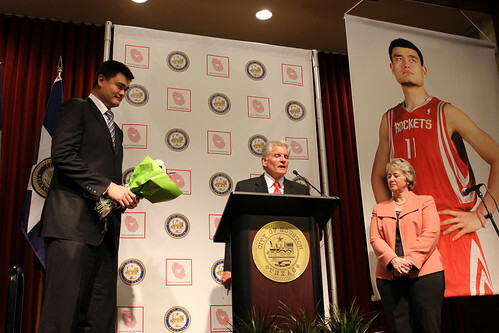 Below is my report from Yao’s activities in Houston on Friday. 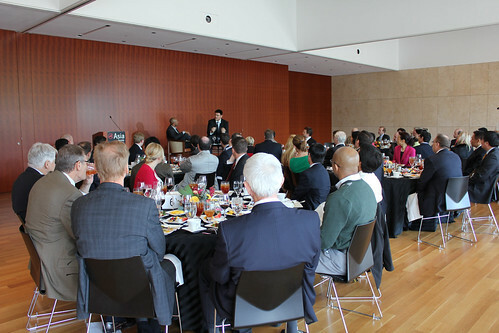 Yao first started the day by making an appearance at the Asia Society Texas Center in Houston where he participated in a luncheon limited to about 40 guests (to keep it very intimate) who purchased premium tickets to benefit the Asia Society to have a great lunch, and hear Yao be interviewed by Jay Williams. Williams was the player chosen #2 in the 2002 NBA Draft right after Yao was selected #1 by the Rockets. Williams is now an analyst for ESPN. Below are some photos from the event. Also served was Yao Ming’s Cabernet Sauvignon from his Yao Family Wines winery. If you want to get a good idea of some of what Yao discussed with Jay, you can check out this video of Yao that was filmed a few days before the luncheon. There were many funny moments as Yao shared his dry wit with the audience. But one of the most touching moments of the discussion happened at the end when Williams corrected an earlier statement of Yao’s when Yao said that every NBA player is unique. 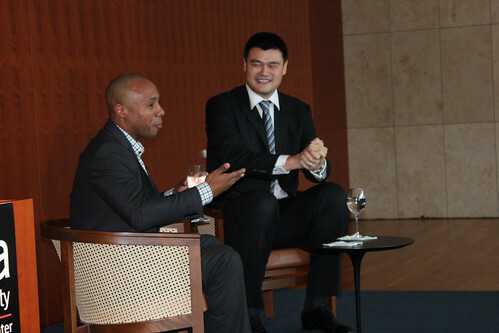 Williams begged to differ, telling the audience that Yao is not only unique because of his talent, but because of his character as well. 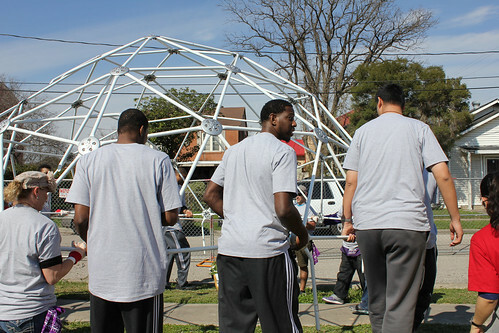 Immediately after the luncheon, Yao went to the 5th Ward in Houston where the NBA was holding one of two events where NBA players in town for the All-Star game could help out in the community. One of the funniest moments occurred when Dikembe Mutombo walked up and told some of the organizers and pointed to a project nearby that Yao should be working on because it was more difficult than the “easy” one he was working on. Yao then moved over to help some other volunteers move a Jungle Jim that had just been assembled to a spot where it would be permanently placed. On his way over, he physically bumped into Tim Duncan (not pictured) from behind, which kind of surprised him, but was funny. A few minutes later, Yao ran into Kobe Bryant and they exchanged a few pleasantries. Bryant seemed really happy to see Yao. That says a ton about how loved Yao is among his former competitors. It’s also refreshing to see a serious superstar like Bryant get a big smile on his face like this one that you rarely see from him. 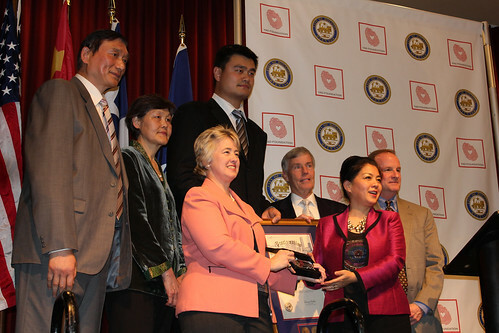 It was at this event where I witnessed that people in Houston still go crazy when they see Yao. It’s really interesting to see how they react when they see him. The looks of awe on their faces when they see how big he is in person — or the smiles he brings to their faces — is amazing. But unlike just a few years ago, it seems like just about everyone has a camera in their cellphone now. As a result, Yao is crowded by even more people because they all want a photo of him, and he was getting requests from tons of people (non NBA players) to have their photo taken with him. To make things worse, many times the requestors would hand their camera phone to someone else to take their photo, but then that person has trouble understanding what button they needed to push on the phone to take the picture, thus making things very awkward and frustrating for people like me who want Yao to be able to move about freely in his life without being a walking tourist attraction. Yao obliged as much as he could with all of these requests, but it really was too much since it slowed him from moving more than a few feet without getting hit up for another request. 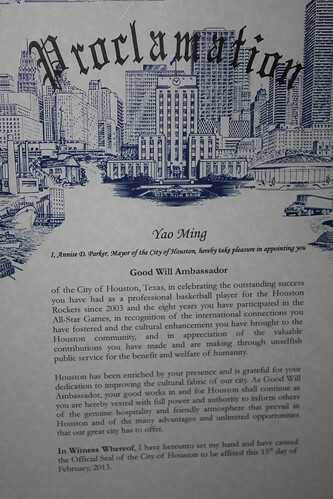 Finally, Yao’s final stop for the day was at Houston’s City Hall where he was officially proclaimed a Goodwill Ambassador for the City of Houston by the mayor. 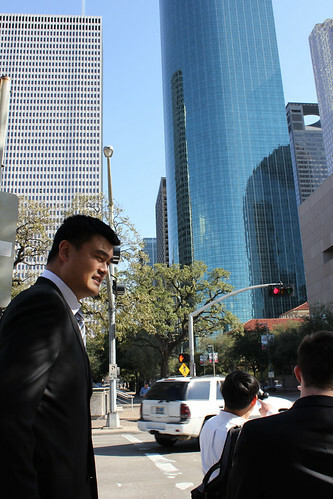 I was able to get some cool photos of Yao walking in downtown Houston and in front of City Hall in the city that has embraced him since 2002. 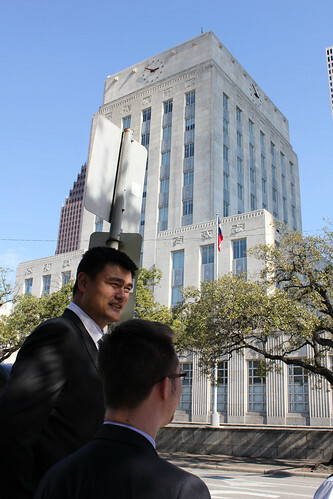 Yao then went inside City Hall where a throng of reporters, photographers and videographers were waiting for him to cover the ceremonial event. Check out the dozen or so cameraman in the back of the room that were there to cover it. You would think that this photo was taken in Shanghai or Beijing with all the media that was there! 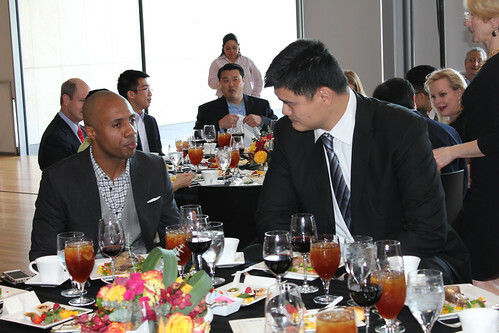 Below Yao and the mayor talk as Rockets’ TV commentator Bill Worrell is about to start his opening remarks. This presentation was a much bigger deal than you would first think since the mayor, Annise Parker, said she purposely has never given a key to the city to anyone since she has been mayor over the past 3 years! 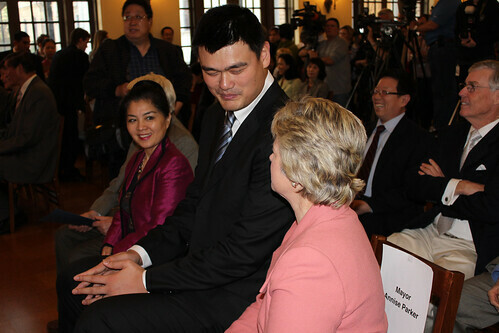 She takes it very seriously, but she knew Yao was a worthy recipient since she knows he will represent the city well. Check out some video here of the mayor’s remarks. A sweet impromptu moment occurred when a little girl of Asian descent (not pictured) in a Houston Rockets jersey brought a bouquet of flowers up to Yao while he was on stage. Yao holds the bouquet in the photo below. 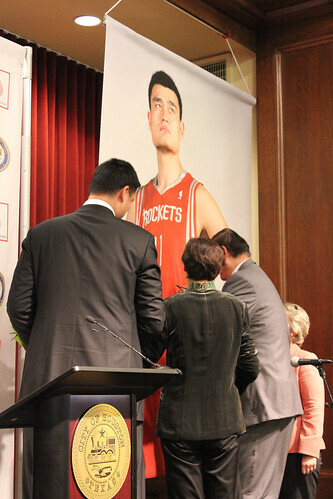 Yao and his parents later signed a large poster of Yao. Afterwards, the media surrounds Yao as you would expect. This entry was posted on Sunday, February 17th, 2013 at 4:44 am	and is filed under Charity work. You can follow any responses to this entry through the RSS 2.0 feed.